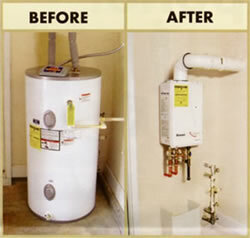 This act will change dramatically the simple act of replacing your water heater! Energy efficiencies are being tightened, once again, specifically as it applies to gas units. Everything over 55 gallons storage will go from an EF of from .53 to .56 to from .74 to .75!!! That will be a very costly changeover. The good news, for now, is that a 40 gallon will only increase from .59 to .62 and a 50 gallon from .58 to .60. Anyone with large hot water issues will be forced to upgrade significantly in order to meet the demand. This may be easier said than done as physical size of heaters will also increase limiting the choices for a practical replacement. Of course I see this as just one more nail in the tank style water heater coffin. The obvious solution is a tankless water heater. The act will increase the tankless standard from .62 to .82. This will level the playing field and remove some of the obvious units from the market. Tankless, or instant hot, has met these standards and more! Way back when I first heard Paul Harvey speak about tankless water heaters I was able to see all these changes that would come to be. The HUGE cost differences have now been eroded and tankless technology can now stand on its own feet. Endless hot water will be enjoyed for up to 25 years from a purchase today. The small foot print permits the unit to be installed in the most practical spot within the house. Energy savings are in the bank. Hard to improve upon perfection. next post: We’re a Family-Owned Business!